Genetec Inc. (Genetec), a leading provider of open-architecture, unified IP security solutions today announced the latest update of AutoVu™ Managed Services (AMS), a turnkey Automatic License Plate Recognition (ALPR) solution that allows parking customers to outsource their IT hardware and management requirements to Genetec. AutoVu Managed Services leverages the cloud to offer end-users independence from on-premises storage, IT management and depreciation costs, and can now accommodate larger fleets of patrol vehicles with support for fixed LPR cameras, addressing end-user requests. AutoVu is offered as part of Genetec™ Security Center, the company’s unified IP security platform that combines access control, video surveillance and ALPR. Genetec will demonstrate AutoVu Managed Services for the first time at the upcoming IPI Parking Show in Nashville, TN (May 17th-20th) on booth # 215 along with its full catalog of AutoVu parking and law enforcement cameras, systems and services. AutoVu Managed Services is expected to be available in mid-May from Genetec AutoVu channel and sales partners. “With the responsibility of managing parking for the City of Richmond, we were having to host and maintain our own servers on premises, which, after troubleshooting, we found were only performing 55% of the time. We also had frustrating performance lag and regularly occurring internal IT conflicts,” said Javon Barner, On-Street Parking Enforcement Manager at the City of Richmond, Virginia. “After we became an early-adopter for AutoVu Managed Services, Genetec took over to manage all parking services and storage needs remotely, resulting almost immediately in a 99% uptime, and working flawlessly ever since. We regularly email our permit and scofflaw lists to Genetec, and within five minutes, everything is up to date. AutoVu Managed Services allows us to focus on parking, while Genetec experts handle the technology,” added Barner. "We created AutoVu Managed Services specifically for customers who are challenged by cost, server space limitations and management of on premises hardware and IT support issues,” said Chris Yigit, Business Development Manager at Genetec. 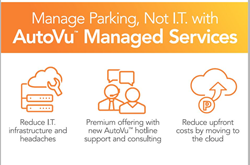 “AutoVu Managed Services offers our customers the most flexible way to focus on what they do best; manage on-site parking enforcement. With the AutoVu ALPR system hosted in the cloud, configuration and maintenance are entrusted to Genetec technicians, for easy deployment, management and support,” continued Yigit. AutoVu Managed Services is offered on a term-basis, removing up-front, capital expenditure costs, available in two-options: AutoVu Managed Services Basic and Premium. AutoVu Managed Services Basic includes the Genetec-hosted back-end ALPR system, parking permit management, assisted Security Center configuration and automated software upgrades. AutoVu Managed Services Premium includes access to a ‘hotline’ contact with Genetec AutoVu experts for ‘white glove’ support and consulting hours to address training, feature updates or counsel on expanding the client’s current AutoVu parking configuration requirements.